...not to buy a fat pig but to sell my beautiful scarves that have been printed in Australia and tested in various situations such as at an exhibition launch at Lee Walters' Cahaya Puri studio and then briefly at Port Douglas Sunday Markets on the waterfront and at the Clink Theatre. Because the scarves are 'high end' they are not for everyone, but there has been such a good response to them, in general, that I have now purchased enough stock to keep the online 'shop' ticking over nicely. A few selected retail outlets will stock the scarves and wraps - starting locally with Jungle Road in Port Douglas and Cairns Botanic Gardens shop. Then I shall probably find an outlet or two in each of the Australian states' capital cities. As you will gather, much of my recent creative output has been involved in the 'business' of art and, to this end, I am building a new website, especially for the scarves. It's called Spirit of Oz - www.spiritofoz.com - and will feature a series of scarves based on Australian stories, developed through my art endeavours. To the Tropical Flowers series I am now adding the Great Barrier Reef series, which will probably be followed by the Outback series, then, maybe, stories about Australian History. I would be very grateful if you had time to check it out and tell me what you think. Is it easy to understand and navigate? Or is it somehow confusing? Bear in mind that it is still a 'work in progress'. Comments below? I'm not sure whether to include canvas prints of the scarf images for sale on the site. What do you think? Good idea? Bad one? That seems to be be a question that prospective clients need answered so I have 'roped in' friends and family as models to show you a few ideas. A couple of weeks ago we were all set for a photographic session but the weather decided otherwise. It was so windy that the scarves 'took off'. 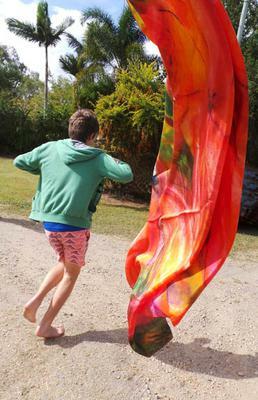 See the photo, above of one of the 'wardrobe assistants', my young grandson, Hurtle, chasing a run-away!